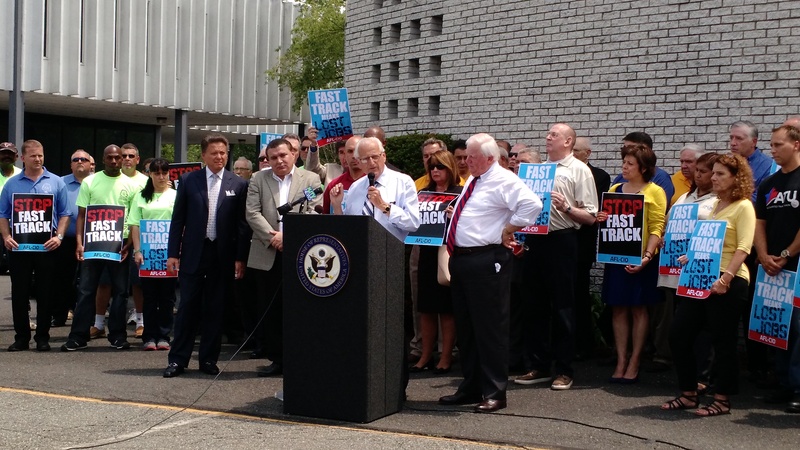 At a press conference at UFCW in Clifton, Congressman Bill Pascrell on 28 May 2015 announced his opposition to “Fast-Track authority” of the Trans Pacific Partnership (TPP), which is now headed for Congressional vote. Although the bill to Fast Track the TPP bill was recently approved by the Senate, New Jersey’s Bob Menendez and Cory Booker voted against it, and now Cong. Pascrell will have his chance to do the same. Truthout offers an explanation of what Fast Track is and why Americans should rally against it. When Congress votes on whether to grant the president “fast-track authority” to negotiate the TPP – which would bar Congress from making any changes to the secret pact after it’s negotiated – it will effectively be a vote to pre-approve the TPP itself. Keeping the negotiating texts secret isn’t keeping other countries from getting secret knowledge about the US position in negotiations. They already have this information. “It’s the public that are being kept in the dark,” Beattie wrote. Who or what was harmed when WikiLeaks published the TPP chapter on intellectual property claims? It does seem a bit counterintuitve that both Bernie Sanders and Cong. Pascrell offer up the financial and physical abuse of foreign workers in their home countries as one of the several reasons that Americans should rally against the TPP. It is certainly true that moral Americans care that the human and economic rights of foreign workers paid 60¢ an hour or less are being exploited, and that we lament the loss of thousands lives to workplace disasters caused by lack of safety protections. But, it is also true that American workers are being forced to compete for jobs with these extremely low-paid workers, so Pascrell’s call for Americans ought to champion “leveling the (workforce) playing field” by calling for protection of these workers doesn’t exactly jibe with the concept of protecting American jobs. On the other hand, however, I sit up and listen when veteran politicians like these men, with impressive voting histories demonstrating clear support for fair labor and social equality in America, tell me that the secret TPP treaty would send even more American jobs overseas and result in less protections for American workers. I’m also a firm believer that human rights practices benefit all of us, so I fundamentally support their message. This is a position with which I wholeheartedly agree. As I often say, democracy isn’t free – and its price tag is our obligation to educate ourselves on the important issues facing our society and voice our opinions about them. Although I know that my Congressman supports legislation like the Trans Pacific Partnership that favors Big Money and the corporate agenda, I also know that this man wants to be elected again. So I make the calls asking Cong. Garrett to vote my way on issues that matter to me. I’ve already asked him to vote NO on the TPP and will continue to let my preferences as a voter in his district, be clearly heard. I have a voice and a vote, and intend to use them both judiciously. Phone calls are a powerful way of communicating your wishes to elected officials. Use this page to find out who your Congressional Representative is by entering your zip code or address. And here’s a list of Congresspeople’s phone numbers.